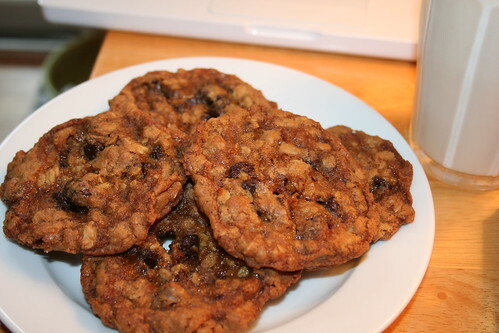 Cookies and rain — Writing… or Typing? These are my mother’s recipe for oatmeal chocolate chip cookies (though John prefers his with abominations instead of chocolate. He doesn’t like chocolate – which is fine: more for me). Of course, by the time I had made them, the tea was gone, so we just had them with milk. Cream sugar and shortening. Add eggs, water, and vanilla and mix. Sift together soda, salt, and flour and add to the mix. Add oatmeal and chocolate chips (I add oatmeal first, then split the batch and set aside half to accommodate the chocolate/vile thing preferences in our household). Use a teaspoon to drop rounded lumps of cookie dough (a bit smaller than golf-ball size) onto greased cookie sheet and bake at 375 for approximately ten minutes. They tend to be fragile when they’re just out of the oven, so I let them cool for a couple of minutes on the cookie sheet before breaking out the spatula and shoveling them on to a cooling rack. Try to contain yourself for a few minutes while they go from molten to merely hot. No, really – try. It’s stopped raining here, and the winds have calmed down. I’m going to open the windows when the birds take a break from the feeder. 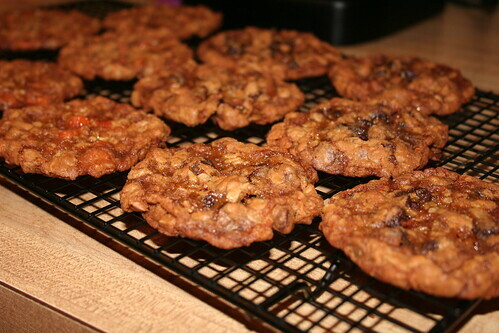 If we made cookies when it rained hard in Washington state we’d be making cookies all the time. Not a bad idea really, especially with ones as delicious as these sound. Butterscotch chips??!! You definitely have the hgh moral ground! I like butterscotch chips! I’d eat them with chocolate chips, too, though. Funny thing about the butterscotch chips – now John says the cookies are too sweet… Well, that makes sense, since butterscotch is about a zillion times sweeter* than semisweet chocolate morsels, which ensure that MY cookies are delish, and the flavor balance on his abominations is whacked. *and I am not a fan of supersweet. As in milk chocolate, me no likey. Too sweet.